A tale of two shops. 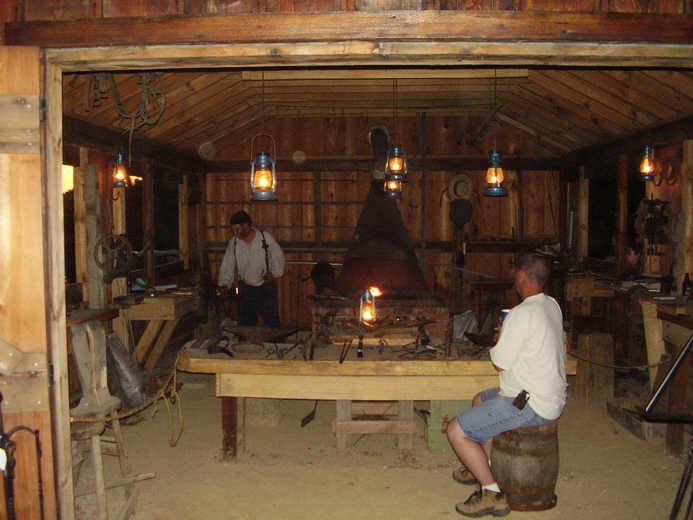 Two different blacksmith shops are featured here and below. We start with the blacksmith in the North Village. 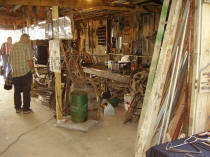 His shop was the first smithy that I found during my first visit to the Old Thresher's Reunion many years ago. A second prominent blacksmith shop is located in the Log Village, and is featured further down this page. How to find the blacksmith in North Village. 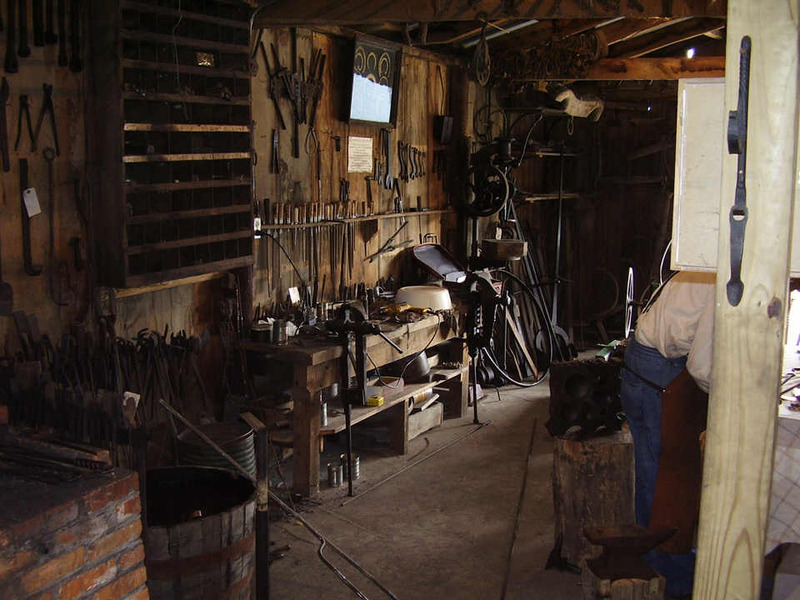 This blacksmith is located on the north side of the railroad tracks, between the railroad depot and the old firehouse (in the North Village of course). 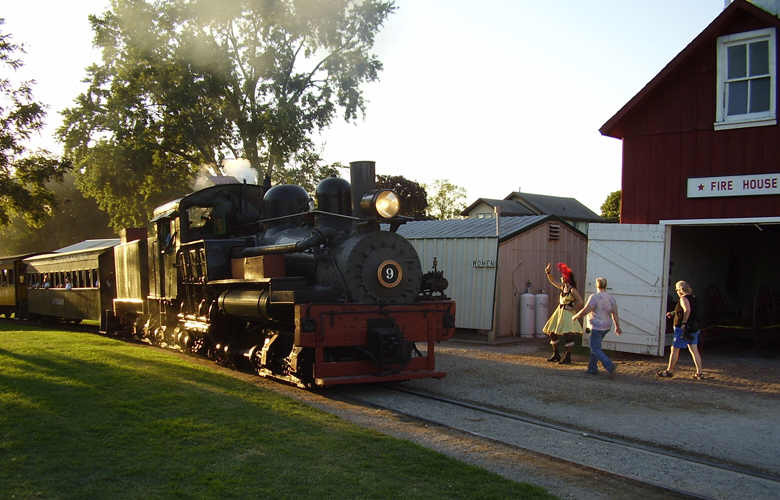 North Village depicts life in an American frontier railroad town during the 1870's with live demonstrations of old hand crafts and trades. Complete with stores, blacksmith shop, print shop, saloon, chuck wagon, train station, and saloon, and even the occasional train robbery. 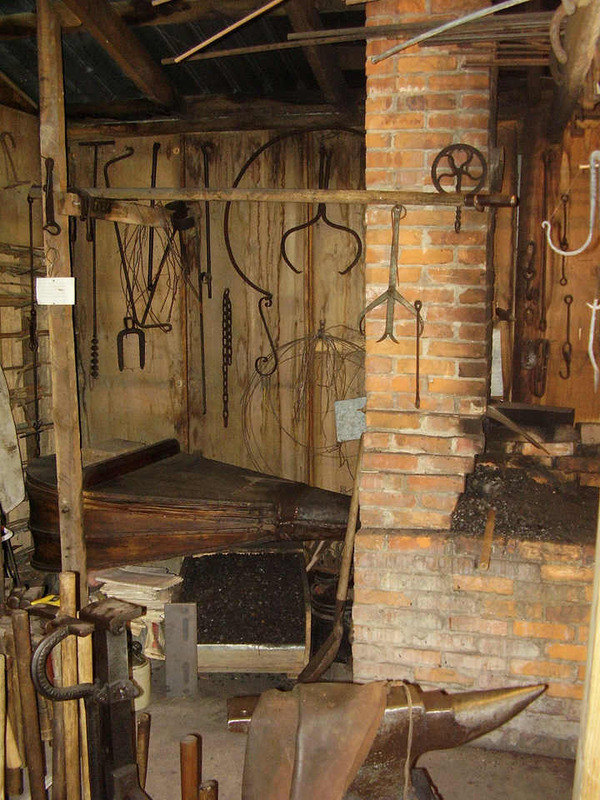 This blacksmith shop is easy to find. 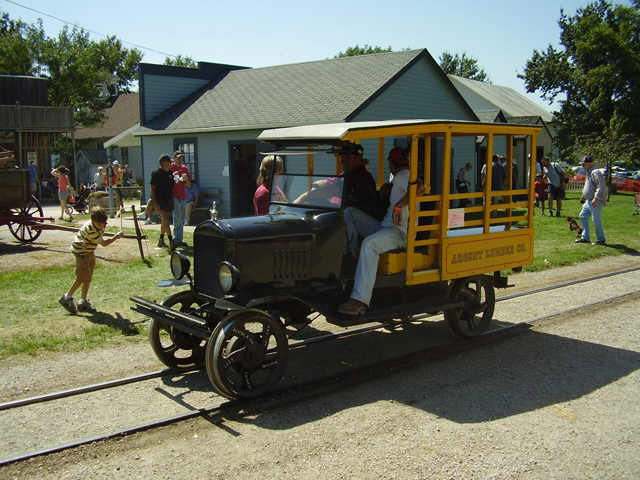 Take the steam train from the main train station near the middle of the Old Thresher's grounds, or just walk north from the main train station - through the dozens of working steam tractors, antique tractors, antique hit and miss engines, until finally you are walking into the old west town called North Village. 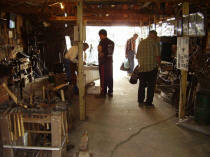 On the edge of town you will find the blacksmith shop and the train station. 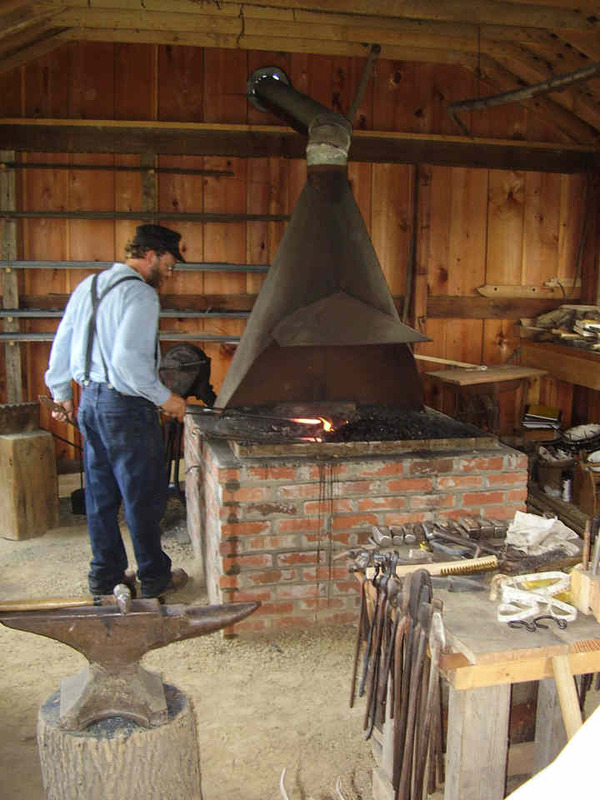 A frontier railroad village blacksmith. The smithy measures roughly 25 by 35 feet. 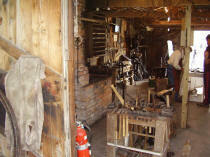 Here the blacksmith forges small items for visitors and repairs some of the items used nearby. 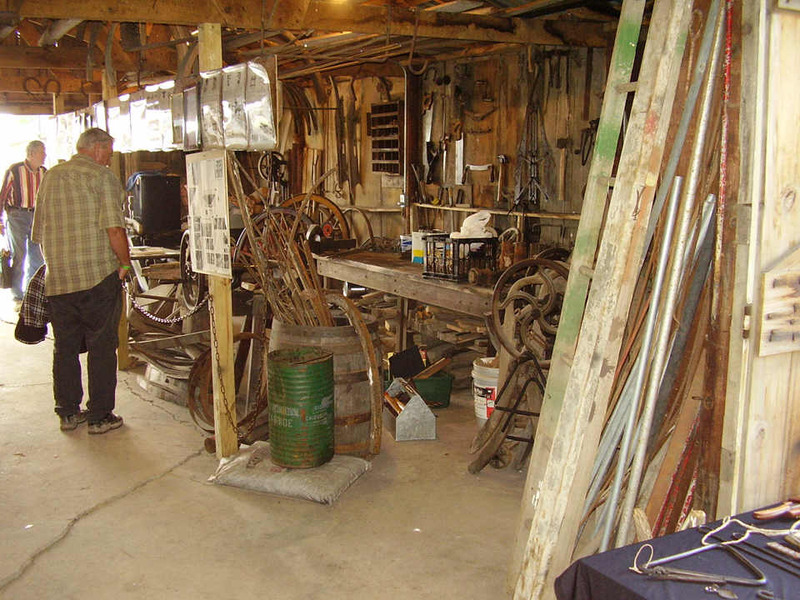 There are tong racks full of tongs, water barrel, vises, cones, swages, hammers, wheel shrinking and rolling tools, planes and drawknives, drills, wooden-wheel boring tools, and horseshoeing tools. Outside is another blacksmith working under the shade of the awning attached to the rear of the smithy. The forge - description. 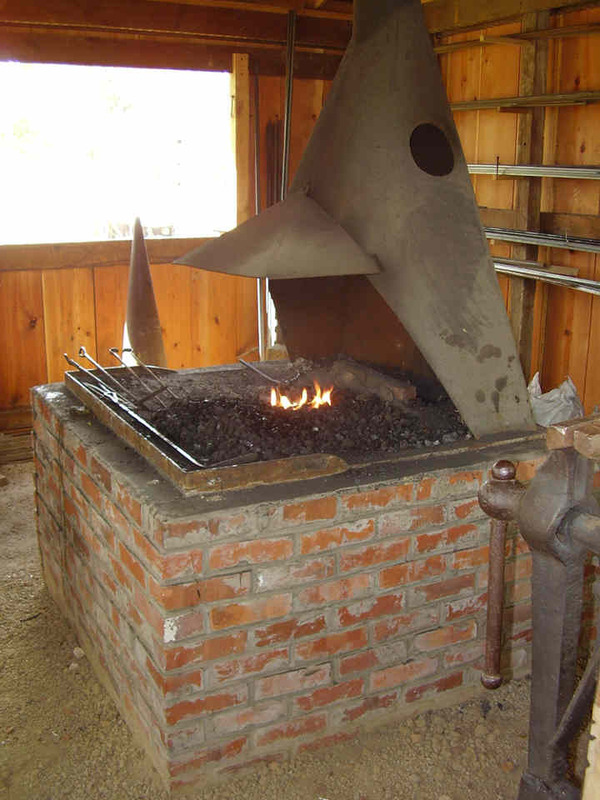 This blacksmith's forge hearth and chimney is made entirely of brick and mortar. The hearth measures approximately 40 inches long x 30 inches across. Air blast is supplied by a great bellows through a 2 inch tuyere pipe to the fire. The bellows is actuated by use of the wooden handle overhead. A hole in the brick structure allows the snout of the bellows (tuyere) to enter the fire from the rear. 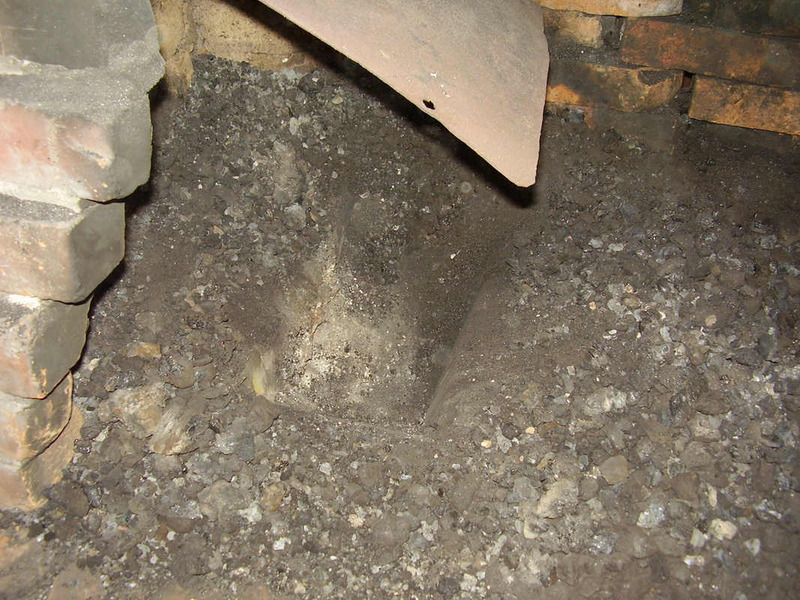 Smoke entryway in the bottom of the chimney is approximately 18 inches tall (6 bricks) and as wide as approximately 17 inches at the base- tapering inward to approximately 12 inches near the top. This forge is both a 'side-blast' and a 'side-draft' design. 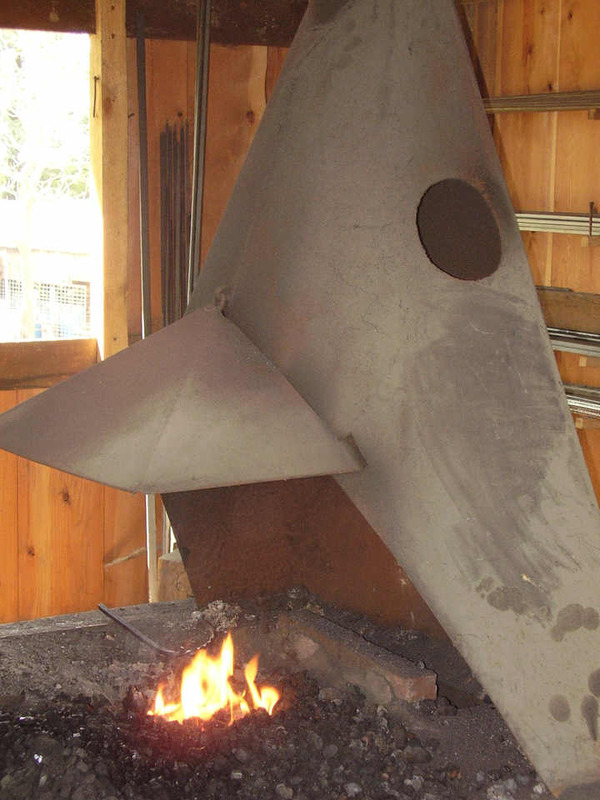 When describing forge construction, the words 'side-blast' and 'side-draft' refer respectively to the direction from which air enters the fire, and the direction that the smoke is conducted into the chimney. Side-blast means that the air is blown into the fire from the side. Side-draft means that smoke enters the chimney sideways through a hole in the bottom of the chimney near the fire rather than through an overhead hood. The hearth. A depression or pit for the fire (fire pit) is built into the hearth. In one of the photos here, we can see that the fire pit has been cleaned out in preparation for starting a new fire, and the opening for the tuyere can be seen entering the middle of the fire pit from the rear. The tuyere pipe is 2 inches diameter round pipe. 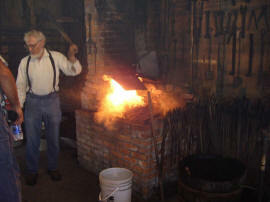 This forge makes a very hot fire very fast - proof that side-blast forges are an excellent choice of design. Inexpensive construction materials available locally. 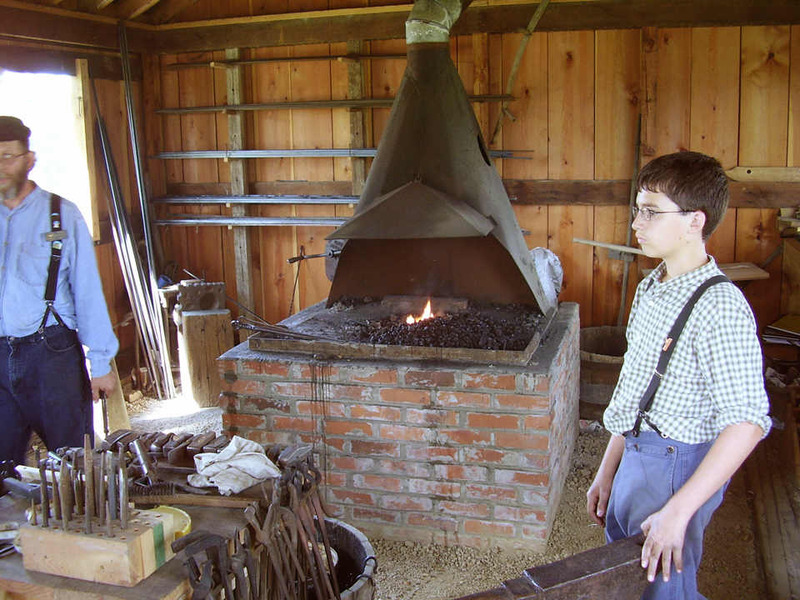 Building a fire pit or depression in the hearth, is part of an older method of forge construction that harkens back to an era when forges were constructed entirely of materials available locally to the blacksmith. The great bellows. 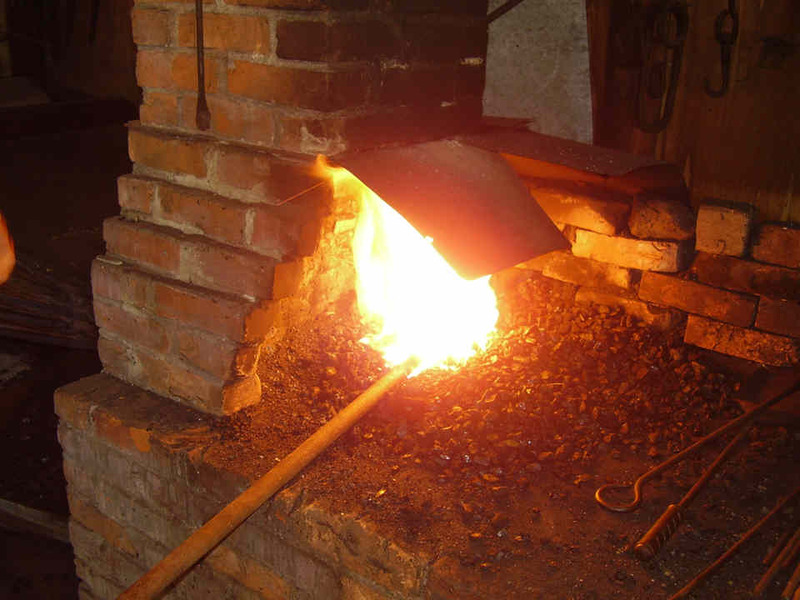 The bellows used in this smithy is a double acting or two-stage (compound) bellows, often called a great bellows, and has a teardrop shape that is widest approximately 2/3 of its length from the tuyere nozzle. 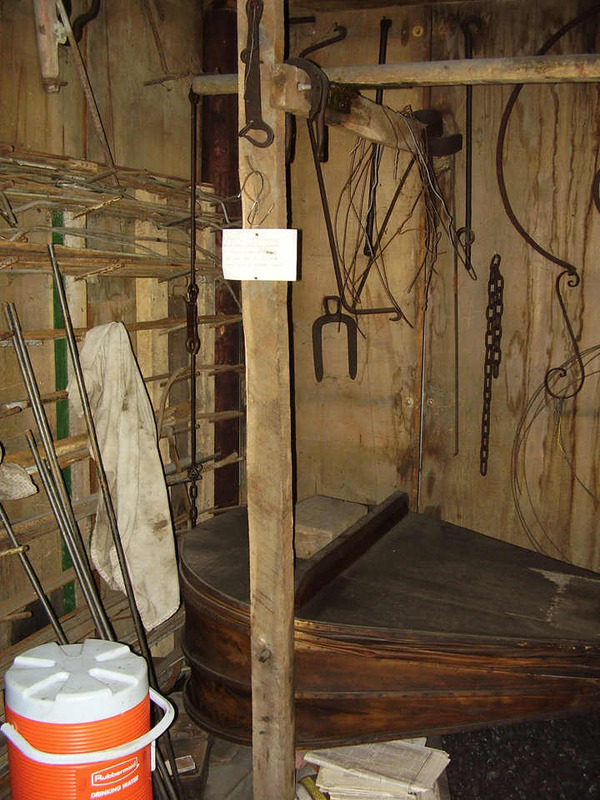 This bellows measures 36 inches width at its widest point, and approximately 60 inches long from the front of the snout to the rear end of the bellows. Pins are installed in the bellows at its widest point, and these pins are attached to posts to support the back of the bellows. 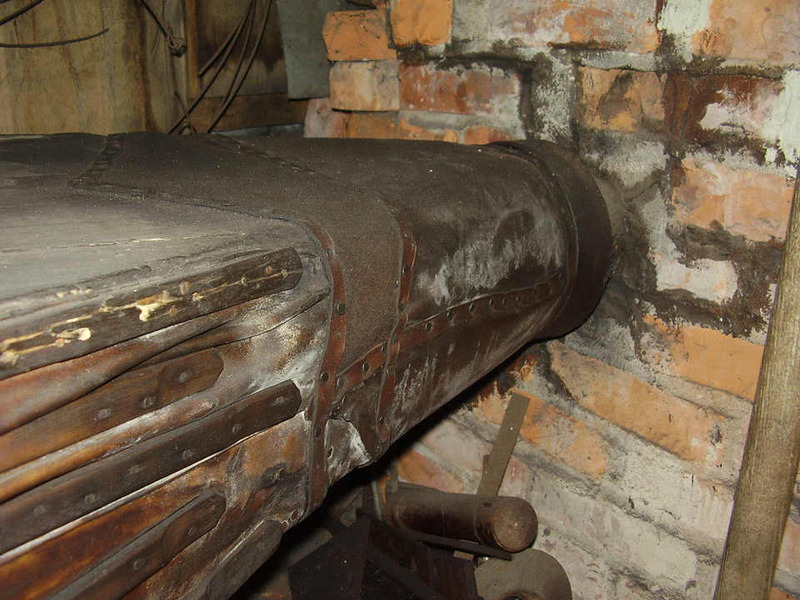 The blast pipe (tuyere) in the front snout of the bellows supports the front of the bellows where it is inserted in the masonry in the rear of the forge hearth. 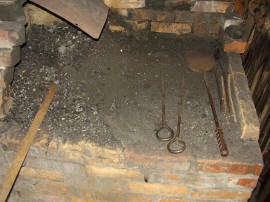 The tuyere that is used in this forge, is an iron pipe built into the masonry of the forge hearth under the chimney. One end of the tuyere protrudes into the rear of the fire pit, and the other end of the tuyere extends out of the rear masonry of this forge. The bellows snout slides into the tuyere pipe and is butted up tight to seal the snout against the tuyere pipe. Weights placed on top of the upper chamber board apply the necessary pressure to force air out of the bellows - into the fire. The handle iron on the end of the bellows lever is made from an iron buggy shaft tip. A hand-cranked drill. 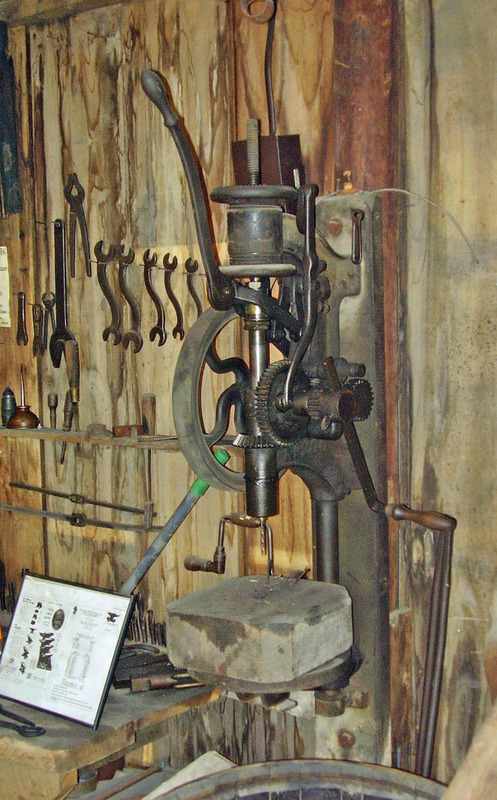 This blacksmith has a nice Champion model 200 hand cranked post drill, shown here with a wooden block placed on the table for drilling. The Champion 200 is a medium size hand crank drill rated at drilling a 1-1/4th inch hole. See the Post Drill page for better photos of this drill. Low initial construction costs. Using fire resistant materials (such as fireplace cement) to create a fire pit in the hearth, is an old and economical method of hearth construction. Initial construction costs of a hearth with a fire pit is much lower than purchasing a cast iron firepot. 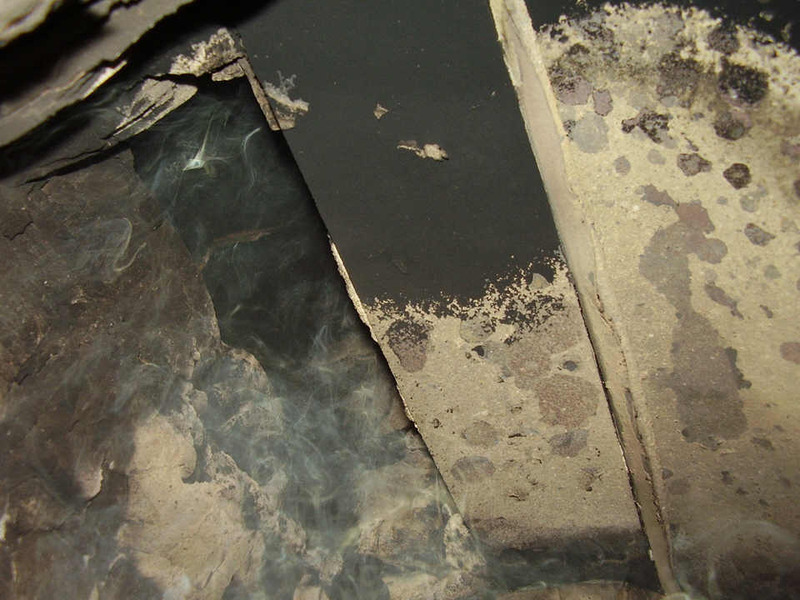 A disadvantage is that the materials that are used to form the fire pit will wear out and deteriorate over time and must be replaced periodically (maybe once or twice each year). In contrast, a cast iron firepot will last 40 years or more with little or no maintenance. 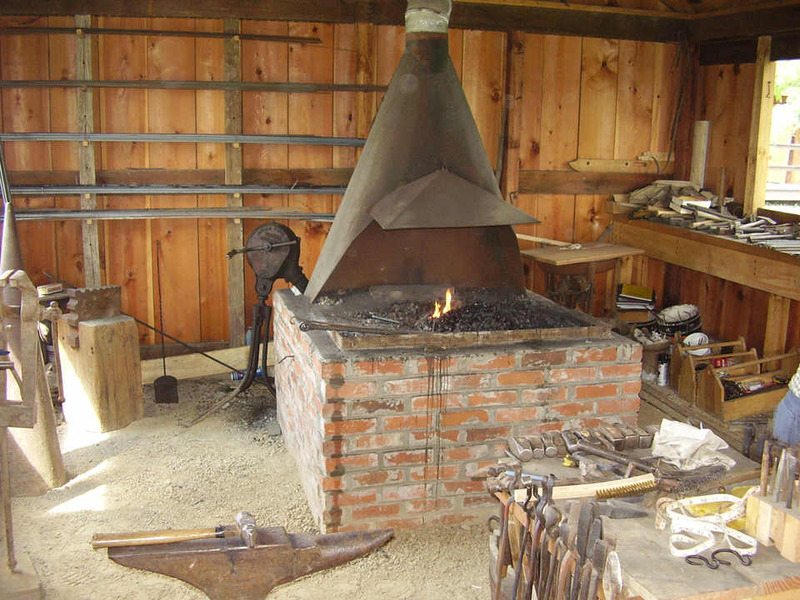 The forge hearth seen here allows for a very hot fire for welding and general forge work. The low initial cost of construction lead me to recommend this style of forge design for smiths that have the skills and tools necessary to build it. An example of an improperly designed chimney smoke shelf. The inner rear wall of the chimney is sloped forward to form a smoke shelf. 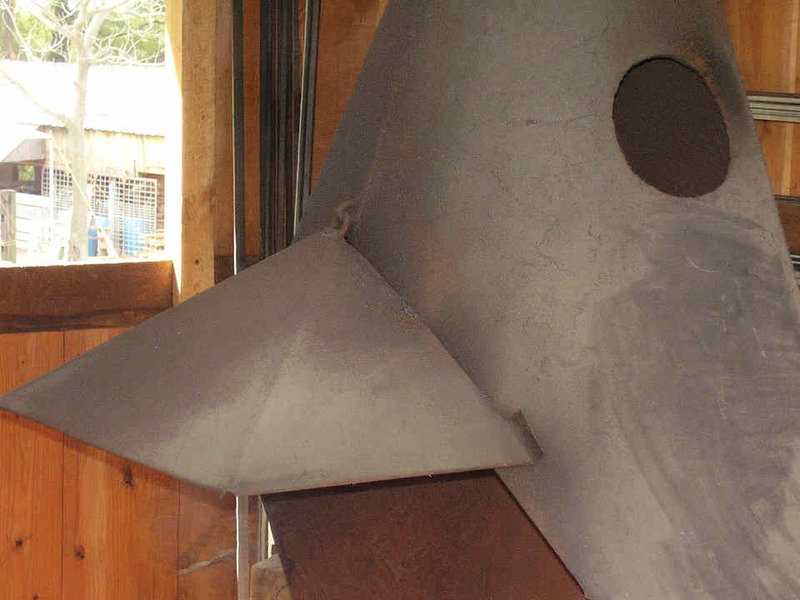 A sheet metal hood is attached to the chimney to help guide the smoke into the smoke entrance. Unfortunately the people that built this forge didn't really understand how a chimney works, and they inadvertently created a choke point that restricts the exhaust action of this chimney. 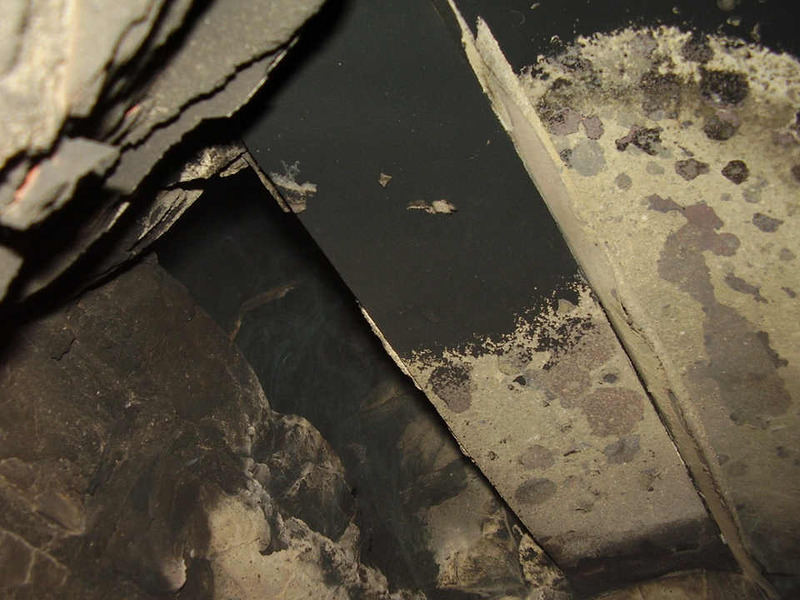 The gap between the smoke shelf and front flue wall is roughly 1/4 the size of the smoke inlet or entrance - severely restricting flow of exhaust gases into the chimney. This is a very smoky chimney. 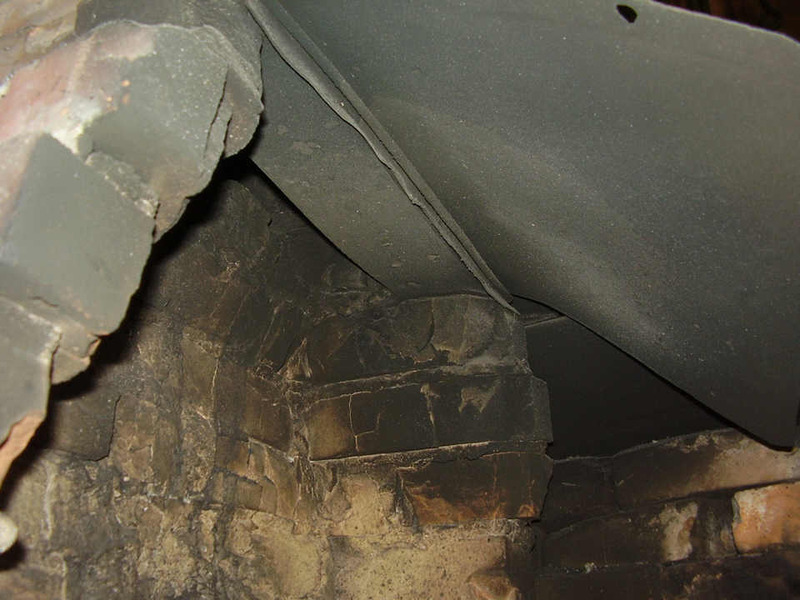 A chimney with a properly designed smoke shelf will have a throat (the open gap between the front of the smoke shelf and front inner wall of the flue) that is larger than the smoke entrance. Foot-trip hazard. 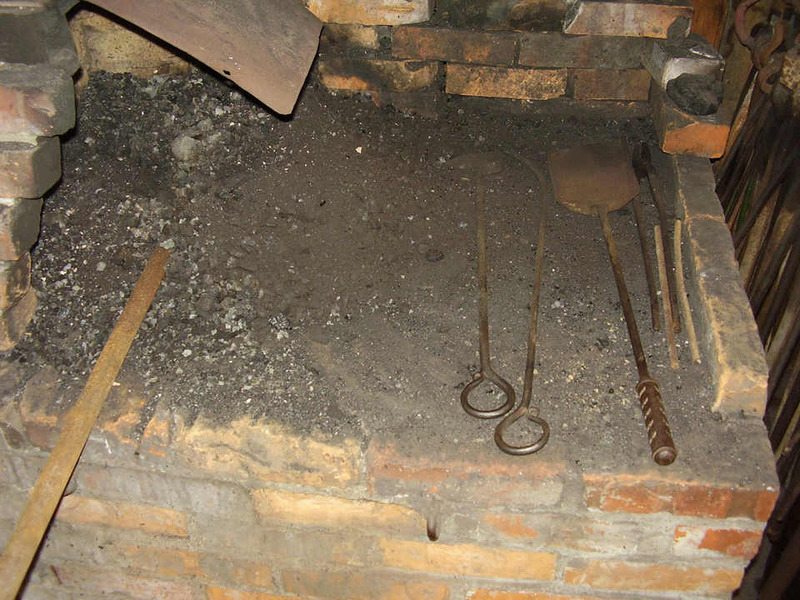 The straight sides of the hearth offer no room for the blacksmith's feet when standing close to the forge, consequently the smith must reach far forward to work in the fire - causing back fatigue. To See an example of a hearth with the masonry corbelled or tapered to allow the smith to place his feet closer to the forge so as not to need to reach forward when working in the fire, see the forge in the Quasdorf Wagon and Blacksmith shop in Dows, Iowa. Conclusion. 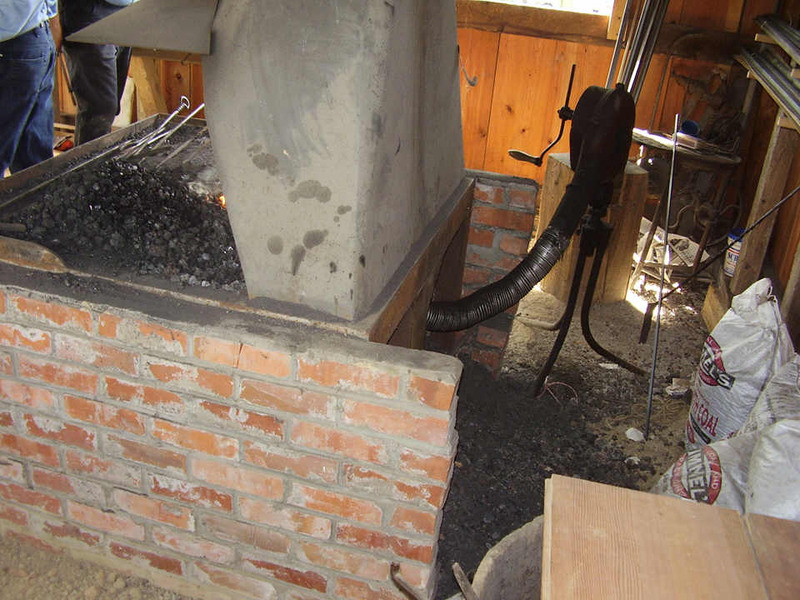 The imperfections in this forge can be easily remedied during construction of a new brick forge thus making this forge hearth a welcome addition to many small blacksmith shops. How to find the Log Village. The log village is located in an isolated area at the far south end of the Old Thresher's park (click on the map picture in the North Village blacksmith section near the top of this page). 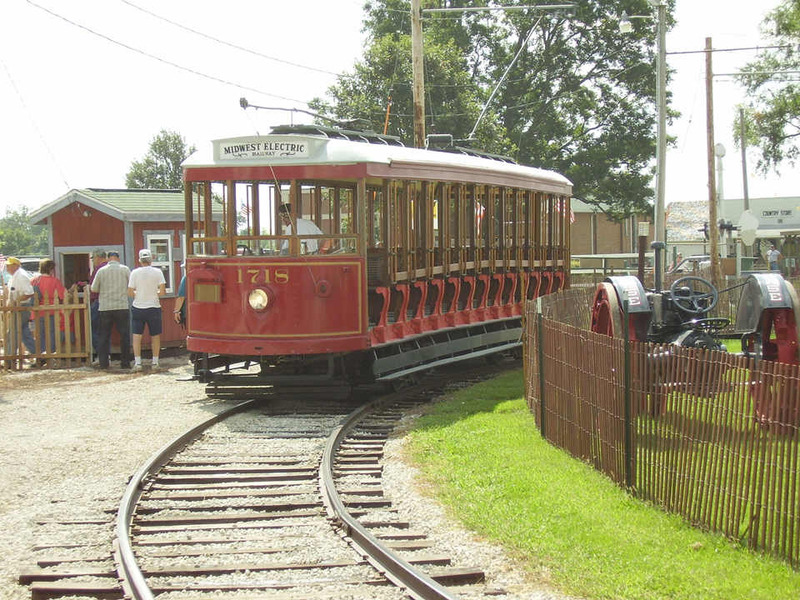 The most convenient and fun way to arrive in the Log Village is to ride one of the electric trolley cars from the trolley depot located near the Carousel Pavilion. 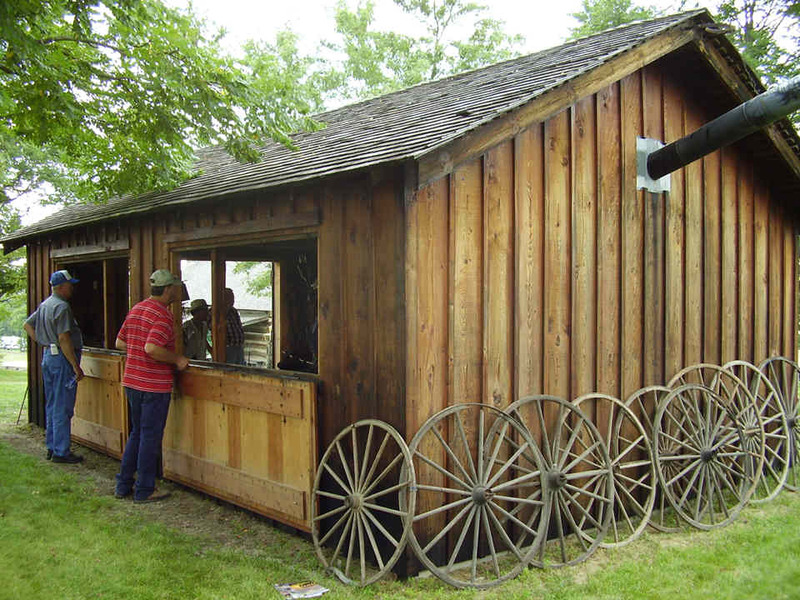 The blacksmith shop is located on the south side of the large barn in the Log Village. 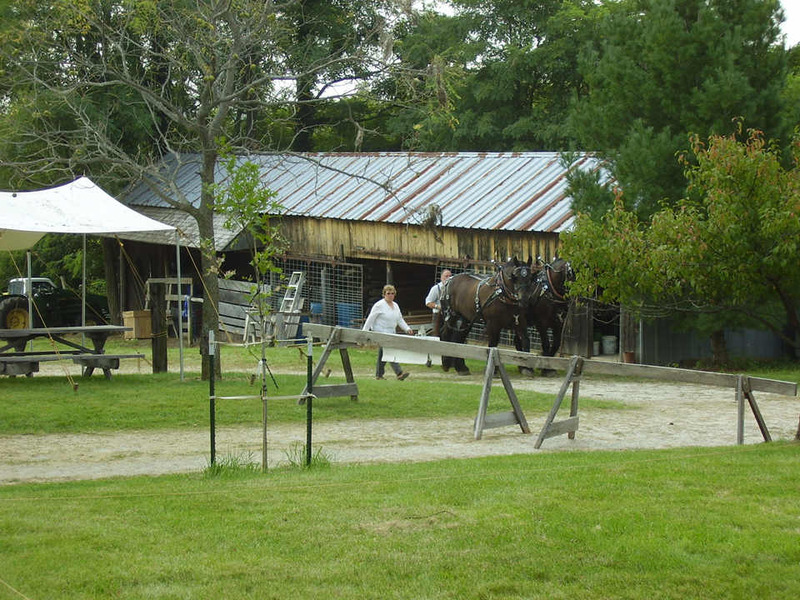 The village has a store, farmhouse, barn with old style farm animals, a blacksmith shop, school, and live horsepower and farm demonstrations of early American life. 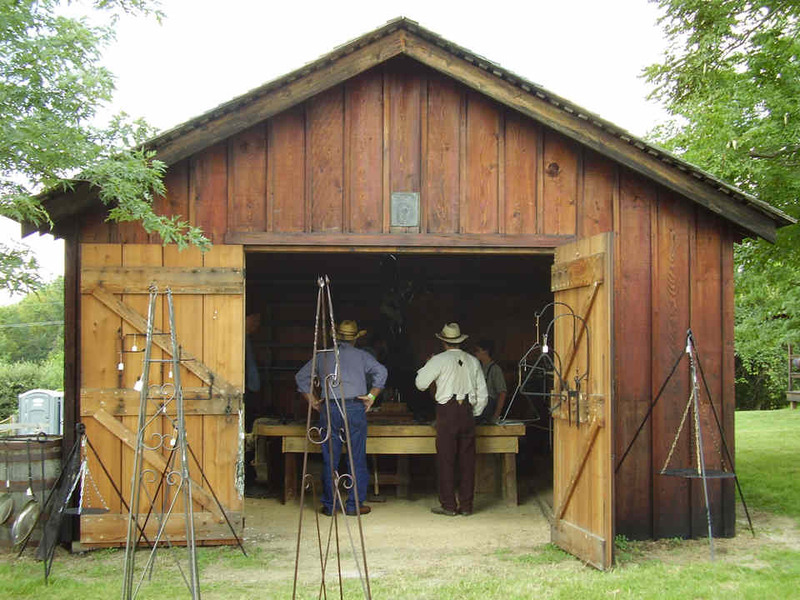 Stepping back in time, the Log Village depicts life in an 1850's era farming village. No electricity. No concrete floors. Everything is hand-powered or animal-powered. 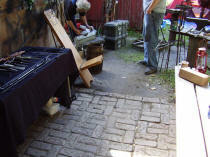 The blacksmith here is always busy making things for visitors and for other craftsmen and exhibitors during the event. 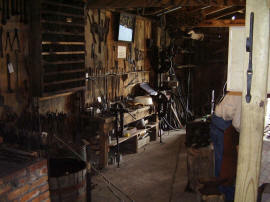 It is a nice place to see a blacksmith working in a small rural or farm setting. A nice atmosphere for a hand-powered shop. The building is open and airy. The forge is large. Large awning windows swing open to let in lots of air and light. Work benches are built onto the walls all around the shop- offering plenty of bench space and tools within easy reach. The forge - description. 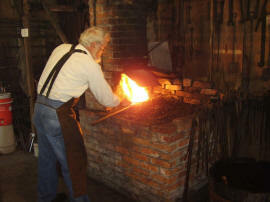 The forge hearth is made of steel with a brick facing to mask the modern materials used in its construction. 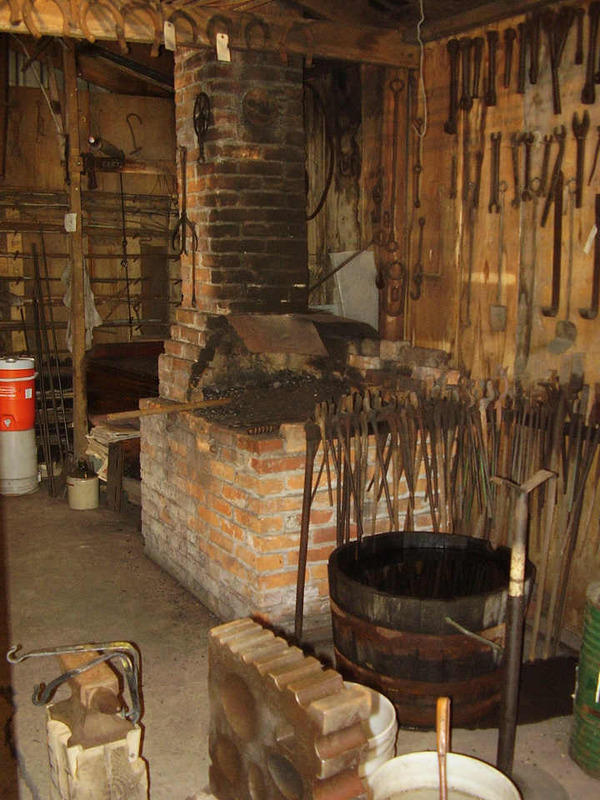 It looks the part of an 1850's smithy but was in fact very simple and inexpensive to build using steel angle iron, steel flats, and sheet iron. I could not get a look at the firepot, but no matter, readers here need only plug in the dimensions of their own firepots to design a similar forge hearth for their own shops (something that they would need to do anyway). 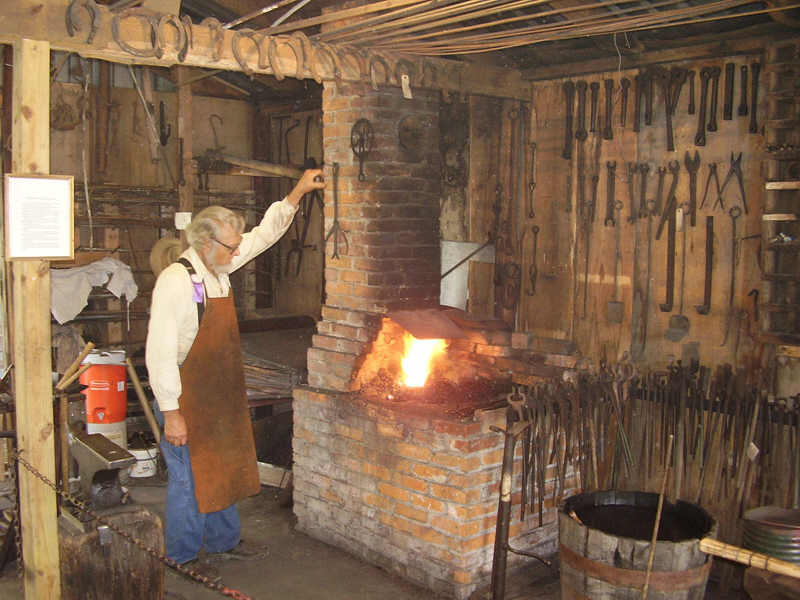 The hearth frame is made of angle iron. I have forgotten the dimensions. It appears to be 2-inch (50mm) angle. The hearth is 40 inches (width) x 38 inches (depth) with the brick facing built around the steel frame measuring 48 inches square. Height of the hearth is approximately 31 inches. All dimensions here are approximate. Bellows, blowers. 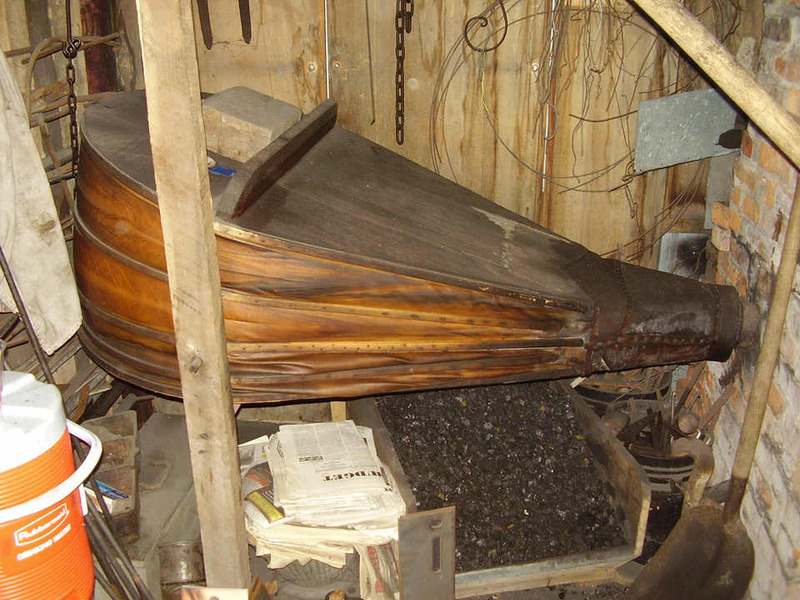 A bellows was originally installed with the forge but recently a hand cranked blower was installed while the bellows awaits repairs. 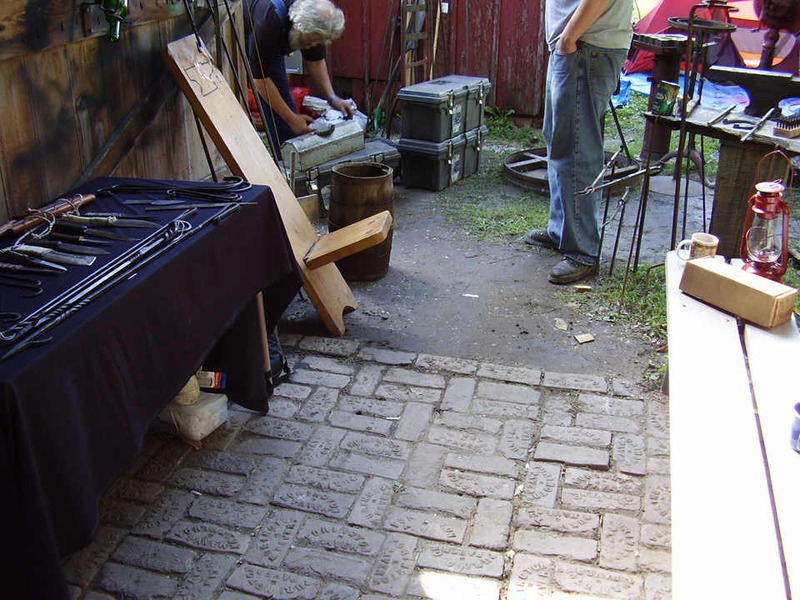 There is open space behind the forge - between the rear of the hearth and the rear wall of the shop - offering storage space for iron and for maintaining the forge tuyere. The hood is made of sheet iron and is very very large. In fact it is so large that it is too far away from the fire and allows too much ambient air to move in behind the fire and displace much of the smoke that would otherwise go up the chimney. The rear wall of the hood appears to be approximately 12 inches behind the firepot. 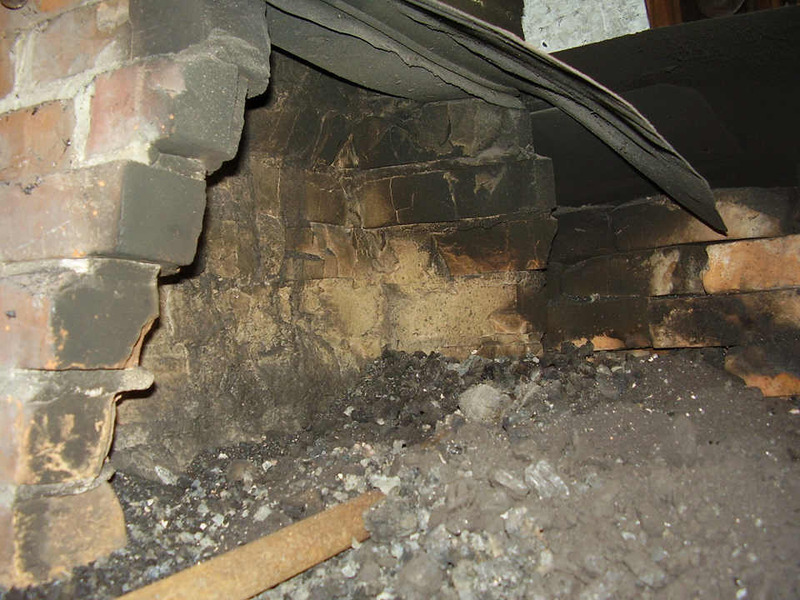 Problem: Due to the lack of a hearth wall near the fire, the smoke is free to meander everywhere but up the chimney. The large space between the fire and back of the sheet metal hood, attracts excessive amounts of ambient air from the shop, and this ambient air displaces smoke that would otherwise enter the chimney. The hole in the side of the hood also allows ambient air to displace smoke that would have gone up the chimney. 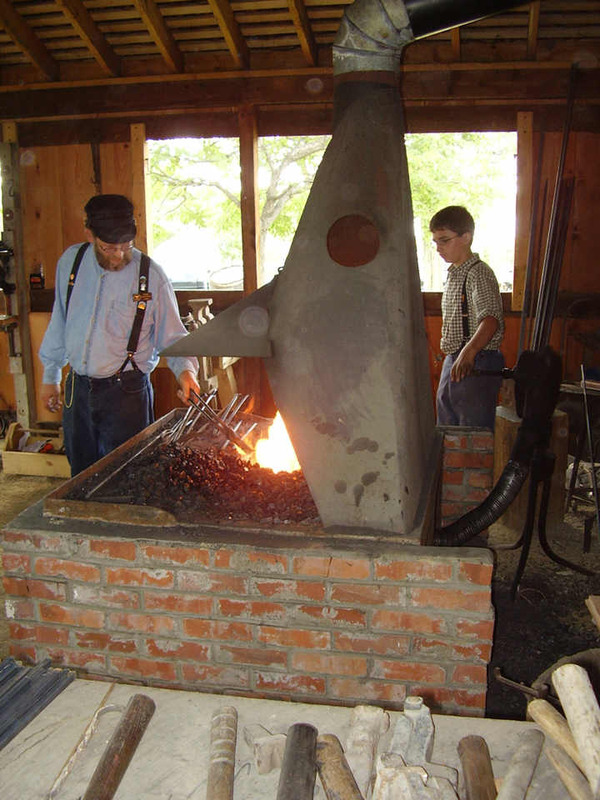 Forge smoke is not hot enough to create a strong chimney gas flow- it requires some nearby structures to help guide it where it needs to go, otherwise it fills the shop with smoke. Problem: The chimney flue pipe is too small in diameter - and the small flue pipe restricts or impedes the flow of smoke. A large hood opening requires a large chimney flue size to exhaust the large amount of ambient air that mixes with the smoke. Problem: The chimney flue exits the building through the rear wall instead of straight up through the roof. Forge smoke is not hot enough to force its way sideways through a horizontal or inclined chimney. Forge chimneys should always be vertical or they will smoke badly. Solutions. The back wall of the hood would offer better performance if it were moved closer to the fire - allowing no more than around 3 or 4 inches between the fire and the rear of the hood. 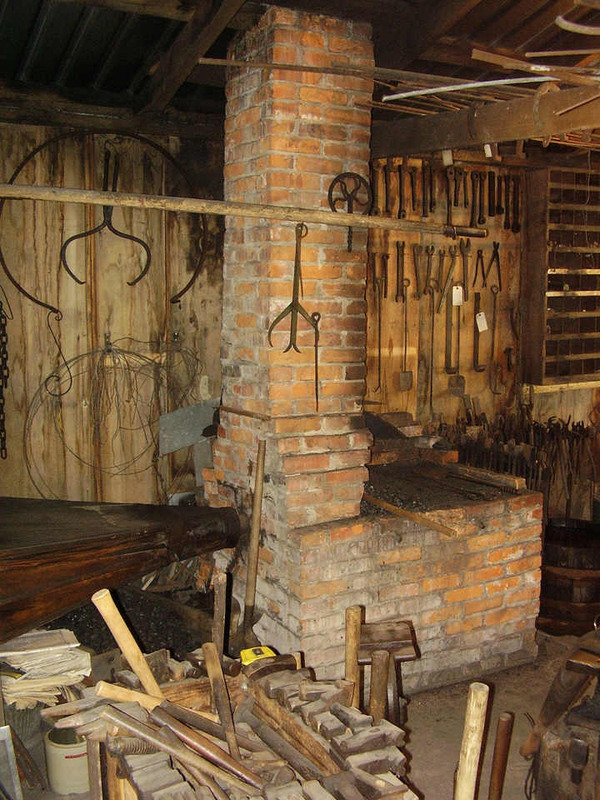 If a blacksmith is presented with a forge such as this one - but is unable to build a new hood and chimney due whatever reasons - there are some quick and easy solutions to solve most of the problems described above. First; The chimney flue at the Log Village smithy is much too small diameter. The chimney flue pipe can be replaced by a larger pipe of for example, 12 inches diameter. If unable to locate a 12-inch pipe, two 6-inch sheet metal stove pipes can be assembled to create a 12-inch pipe. The larger flue pipe size will dramatically increase gas flow in the chimney. While replacing the small chimney flu with a large flue, trim off around 6-8 inches off the top of the hood (this must be done anyway if a 12-inch flu pipe is installed), remove the elbow that attaches to the top of the hood, and begin the curve transition by cutting into the rear of the hood - thus lowering the end of the flu pipe as it attaches to the hood. In addition, the hole in the wall must be enlarged for the larger flue pipe, and it would be best to enlarge only the upper side of this hole. By lowering the point at which the hood transitions into the chimney flue, and by raising the center point of the hole in the wall (through which the chimney must pass), the overall incline of the chimney becomes steeper and thus reduces resistance to gas flow and increases velocity. The ideal solution would be to keep the chimney as straight and vertical as possible, preferably by taking it straight up through the roof directly above the forge hearth. Second; Adding a wall of firebrick between the fire and the rear wall of the hood, will enhance the smoke attraction and increase the smoke removal. Smoke is attracted to a brick wall. This must be seen to be understood. The smoke will hug the wall all the way into the chimney - and not be displaced by ambient air. An inner brick wall that is stacked up roughly 4 -6 inches above the level of the front of the hood, will incidentally create a smoke shelf that will dramatically increase chimney performance. Again, this must be seen in action to be fully appreciated. 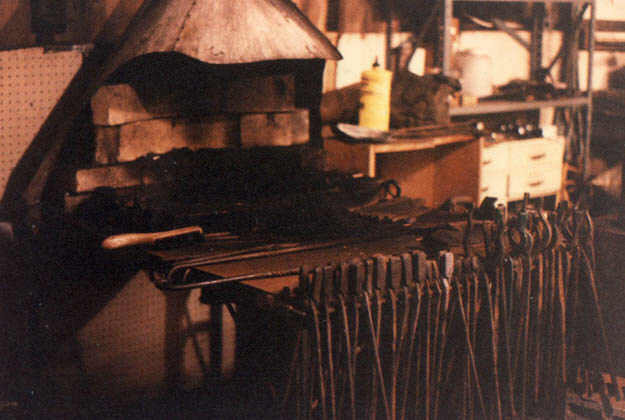 The forge (shown at right) is featured near the bottom of the Steel & Brick forge page here: http://www.beautifuliron.com/steel.htm . Smoke was attracted to, and guided into the chimney by the brick wall. The wall also helped to restart this chimney after smoke was previously stopped by wind gusts. And one last solution; patch the hole in the side of the hood. This will help keep out the ambient air that is displacing smoke by entering through the side of the hood. 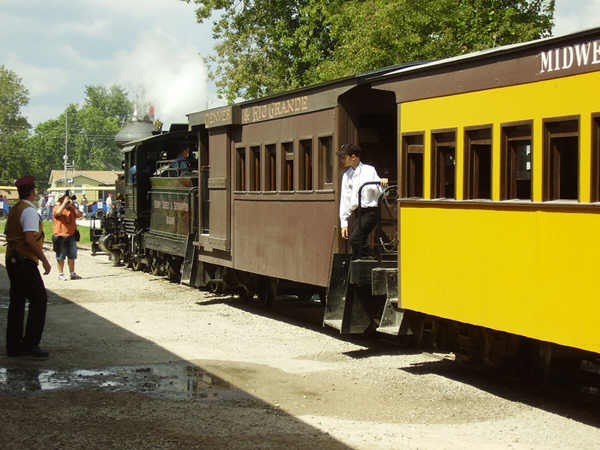 Steam trains run on narrow gauge tracks laid around the perimeter of the northern half of the park. 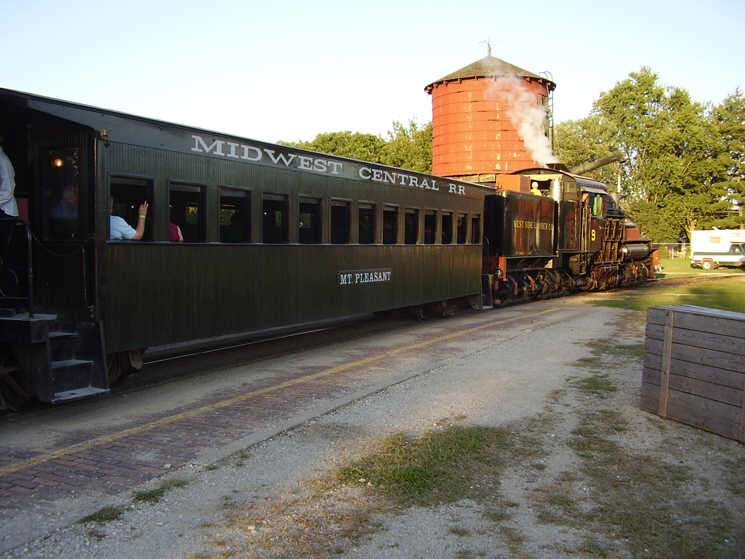 The two most prominent and recently restored steam trains shown here operated by the Midwest Central Railroad, are the Mogul 2-6-0 and the Shay all wheel drive engines. These are really beautiful engines and are a 'must see'. 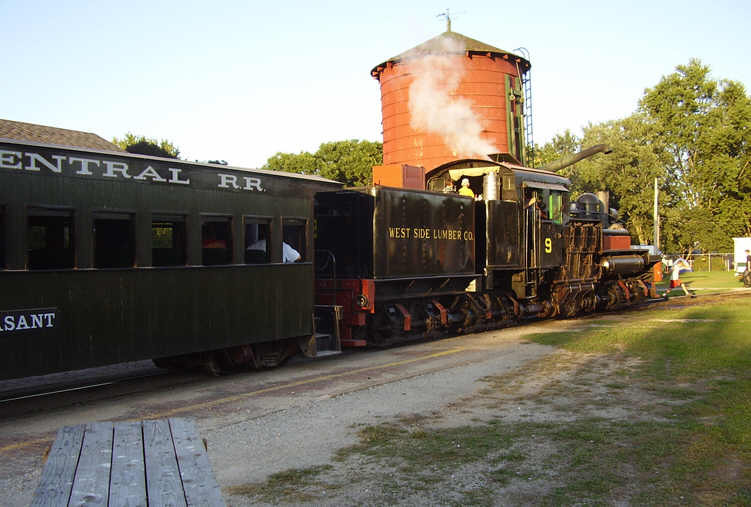 The steam train shown at left is arriving at the station in North Village, is pulled by a Engine #6 - a Mogul 2-6-0 locomotive built by the Baldwin Locomotive company in 1891. The engine shown at left is waiting for passengers at the train station in the North Village. 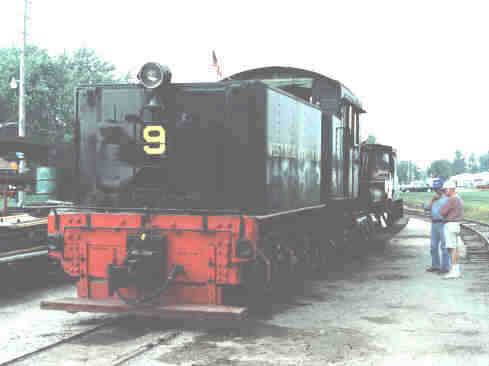 This engine was converted to oil so there is little or no smoke. But steam can be seen escaping from the turbine that generates electricity for the lights. 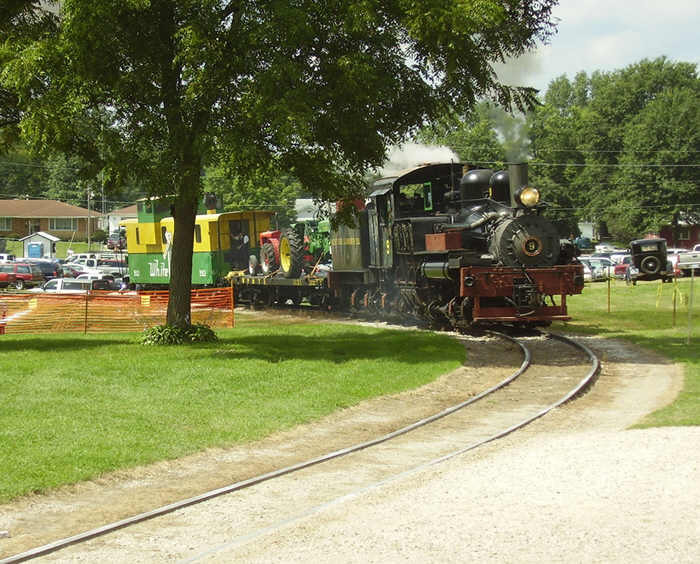 A model T Ford foreman's truck is at far left, and engine #9 (an all-wheel-drive) Shay built by Lima Locomotive Works in 1923 pulls a passenger train during the Old Thresher's Reunion 2008. 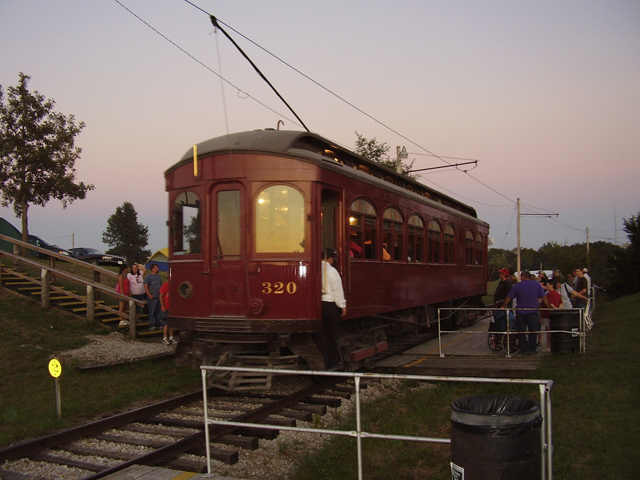 Electric trolleys or streetcars run on wide gauge tracks laid around the southern half of the park. The electric trolleys are a fun way to travel back to the camp grounds or to visit the Log Village in the south of the park. Mt. Pleasant is home to the Mt. Pleasant Old Thresher's Reunion steam power show every year during Labor Day weekend. The photos here show only the limited range of things that this author was most interested in while visiting the Old Thresher's Reunion. These photos cannot even begin to give any real impression of the tremendous number of activities and attractions at this event. 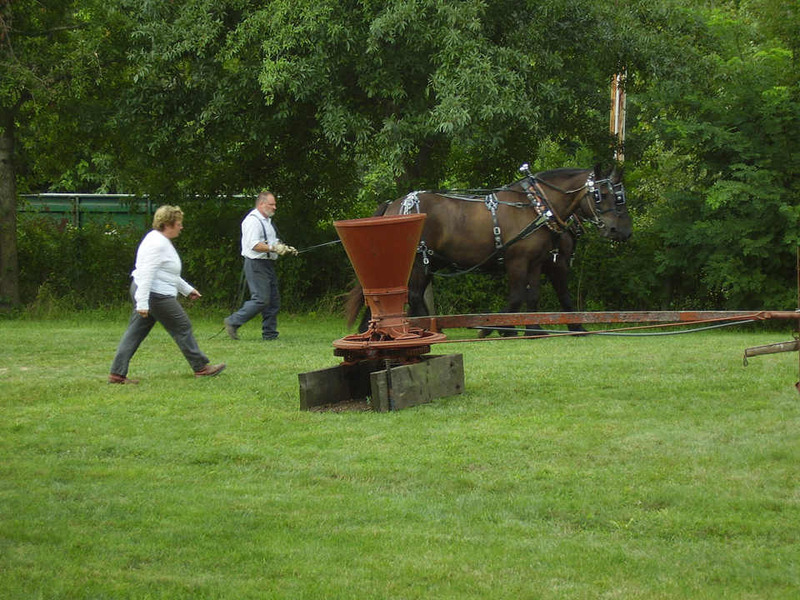 Many restored steam tractors present throughout the event are in use powering antique threshing machinery, saw mills, veneer cutting machines, and other equipment. 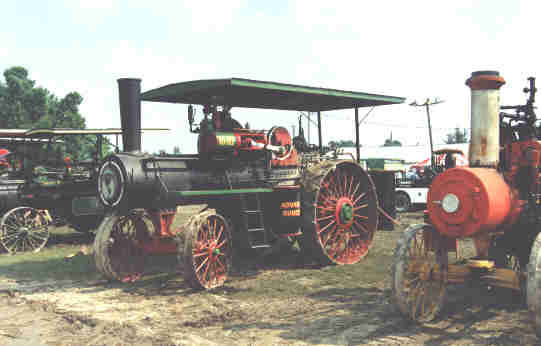 Steam tractor restoration prospects are also offered here for sale. Two large buildings on the fair grounds exhibit the largest collection of antique and horse drawn farming equipment I have ever seen in one place. 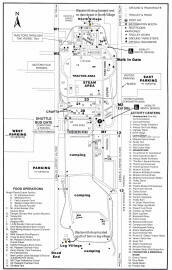 Other buildings show off restored antique automobiles, large stationary engines, antique power plant generation engines and pumping engines. 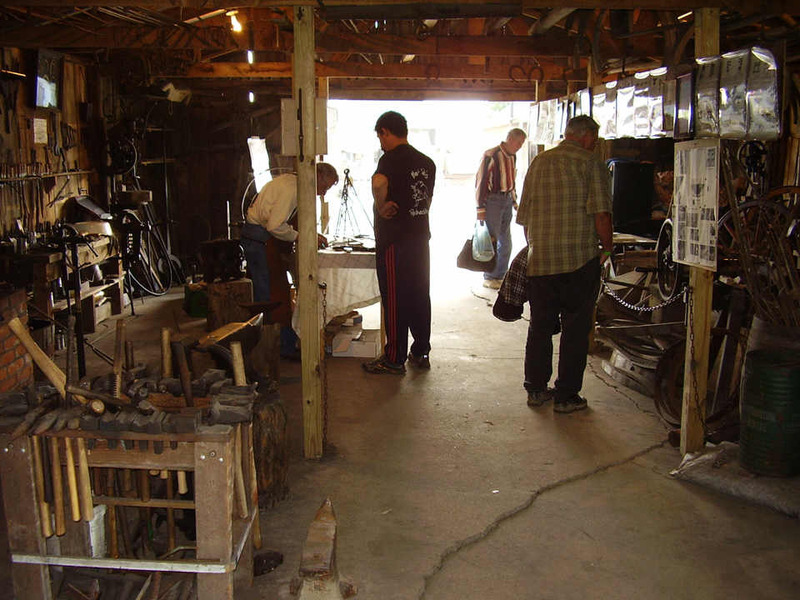 An antique machine shop is set up near the stationary engines. Restored steam locomotives are fired up and driven around the park and visitors can ride on the trains. 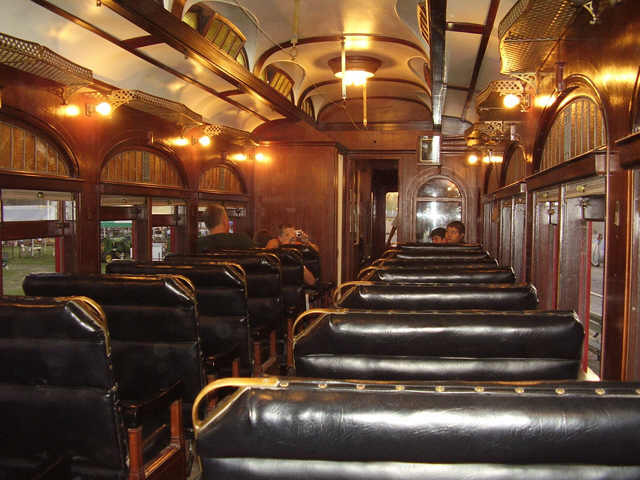 Train robberies occur on some of the rides. 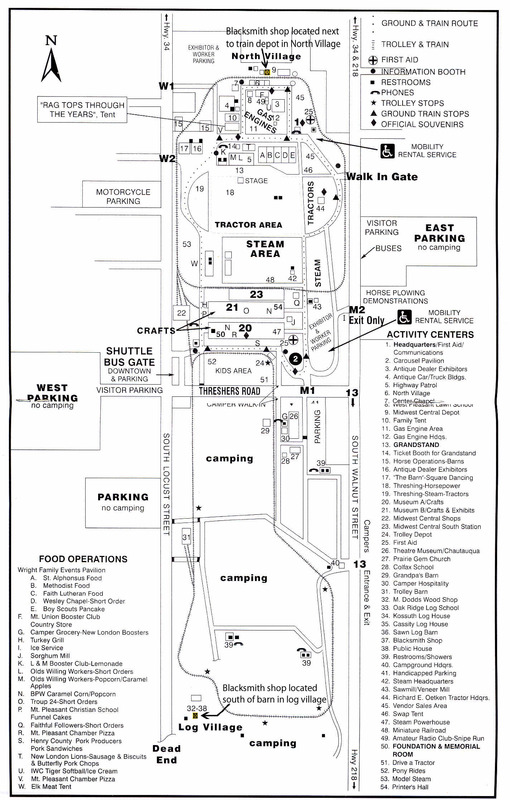 A large grandstand hosts horse and tractor pulls during the day and live music by popular bands at night. 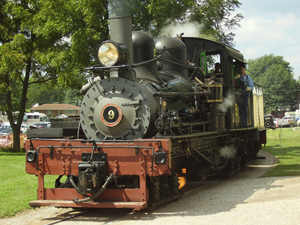 Another excellent restored locomotive operated during Old Thresher's is the Shay geared all-wheel-drive engine built by Lima Locomotive works in 1923. 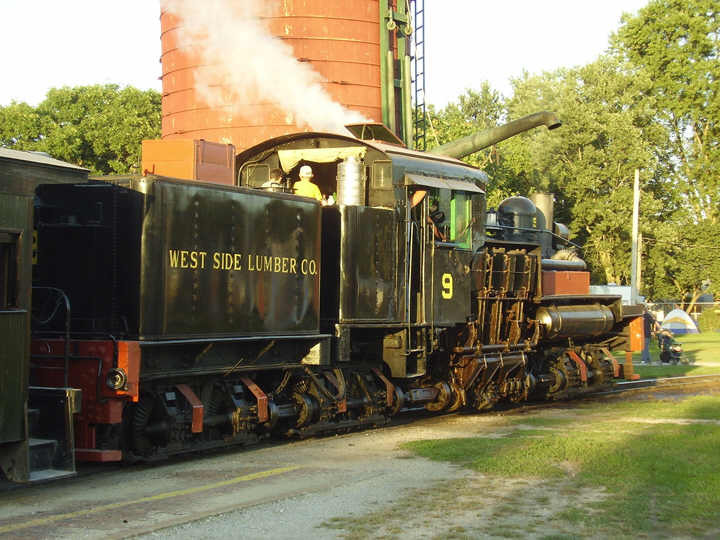 Previously used as a logging train engine in California until 1962. The Shay is driven around the grounds each year pulling passenger trains full of visitors and runs opposite the fancier 2-6-0 Mogul shown above. 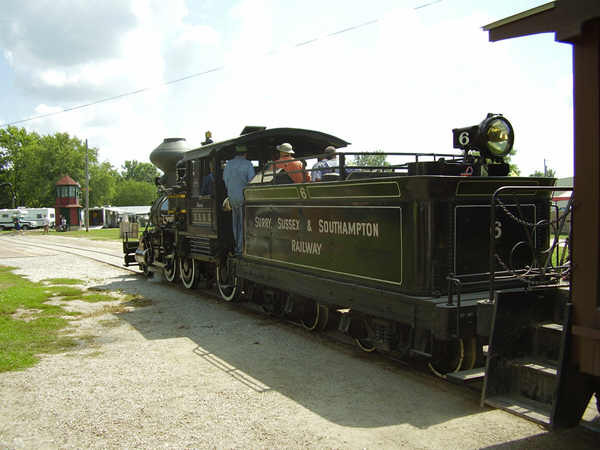 The Shay engine is oil fired so very little smoke is visible while this engine is operating. 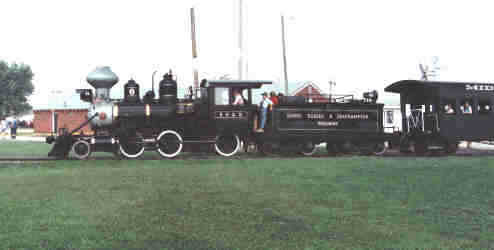 The Shay and the Mogul operated by the MCRR are narrow gauge, note the size of this engine compared with the people standing next to it. 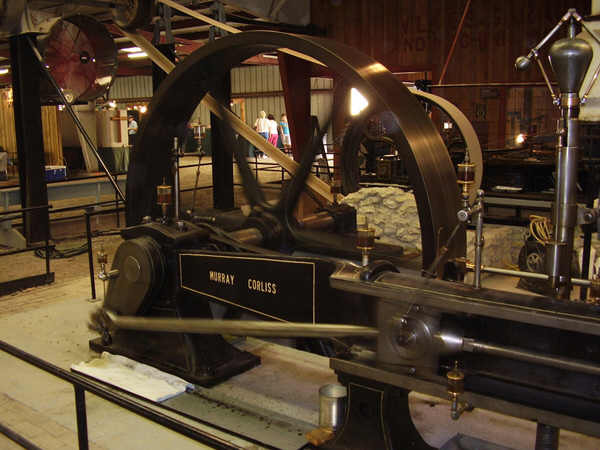 Stationary steam engines in the large museum (Museum A - Steam Powerhouse). 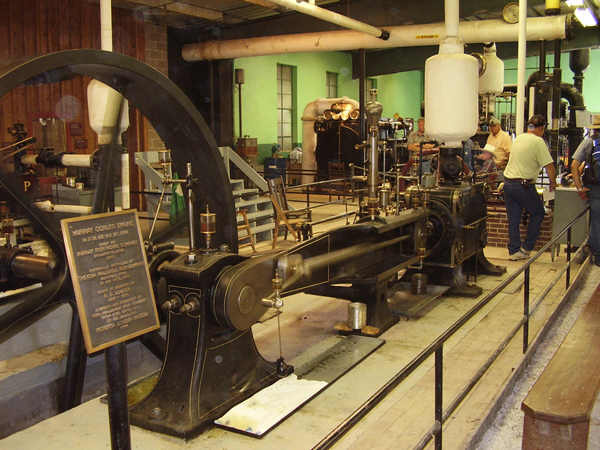 Stationary steam powered electrical generators, ammonia pumping plant, stationary oil and gas fired electrical generation engines. Latest update March 20, 2011. Readers who have knowledge or documentation on these blacksmith shops are invited to mail the author at the email address below.